The Great American Beers of 2014: across the U.S. (and in the DMV). Judges have judged. Medals have been awarded. Champions declared. Thousands of beers drunk. The 2014 Great American Beer Festival —held at the Colorado Convention Center, in Denver, Colorado, Thursday through Saturday, 2-4 October, with 49,000 good beer fans in attendance— is now history. The Great American Beer Festival is the premier U.S. beer festival and competition. Each year, GABF represents the largest collection of U.S. beer ever served, in the format of a public tasting event plus a private competition. GABF was founded in 1982, and has been growing and evolving along with the American craft brewing industry ever since. [...] The 2014 Great American Beer Festival competition awarded 268 medals (in 90 categories), plus three GABF Pro-Am medals, [from 1,309 breweries, in all 50 states and Washington, D.C.] In its 28th year, the 2014 competition surpassed all previous participation records... with 222 beer experts from 10 countries evaluating 5,507 commercial entries, plus 89 Pro-Am entries, with assistance from some 150 competition volunteers. An excellent beer that may vary slightly from style parameters while maintaining close adherence to the style and displaying excellent taste, aroma and appearance. A fine example of the style that may vary slightly from style parameters and/or have minor deviations in taste, aroma or appearance. If all the substyles recognized at this year's GABF were added to the number of all the style categories, the total count of beer styles for the competition would reach 180. As evidence of this conspicuous inflation, the 2014 GABF competition featured three new categories: Belgian-Style Fruit Beer, with 41 entries; Historical Beer, with 12 entries; and Kuyt Beer, which had no entries. Saké, for example, was considered a sub-style of Experimental Beer (Category #16). Please don't tell the Japanese that saké is only "experimental." And, the International Style Pale Ale (Category #51a)? What exactly does 'international' taste like? And, what could the difference possibly be between an American India Pale Ale (Category #55) and an American Strong Pale Ale (Category #53)? The business and soul of 'craft' beer might be better served if the GABF, rather than birthing or disinterring styles, were to award scores in addition to medals (as wine and spirits do, for better or worse). Thus, even if a brewery might not secure one of three medals in a style-category, it might still receive a high score, and use that number to promote its image, and thus all of 'craft' beer. So ... the winners of the 2014 Great American Beer Festival —those with the bragging rights of best-beer-in-America (until next year)— are these. I'm not certain of the exact algorithm used to determine the results, but it must (I assume) involve medal count and strength of finish. Bastone Brewery: Royal Oak, Michigan. Brasserie Saint James: Reno, Nevada. Beachwood BBQ & Brewing: Long Beach, California. Marble Brewery: Albuquerque, New Mexico. Devils Backbone Brewing Co.—Outpost: Lexington, Virginia. AC Golden brewing Company: Golden, Colorado. These are numbers somewhat in a vacuum, as the GABF does not reveal the number of breweries submitting from each state. But, still, the results are those expected at the top, and interesting beneath. It's worth reading Alworth's analysis. 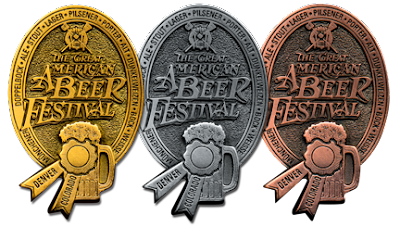 You can see the list of all the winners in each category this year —and every year, dating back to 1983, when the GABF was first held— at the festival website: www.greatamericanbeerfestival.com. 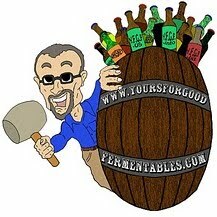 Now, on to the winners in the DMV —that is, the District of Columbia, Maryland, and Virginia— the home territory for Yours For Good Fermentables. Last year, in 2013, no beers from the District medalled at the GABF (although they have before). So, this year, hearty congratulations go to DC Brau for its silver medal, for The Citizen, in the Belgian-and French-style Ale division (Category #73). At last year's GABF, Maryland grabbed only one medal, a bronze for Flying Dog, in Frederick. This year, the 'Free State' garnered five medals, including one gold by the Gordon-Biersch Brewpub, in Annapolis, for its Rauchbier. In 2013, Virginia took home fourteen medals, four of them gold (two of those from Devils Backbone, in both the Lexington and Roseland locations, and one each from Port City, in Alexandria, and Lost Rhino, in Ashburn), the 5th most medals accrued by any state. 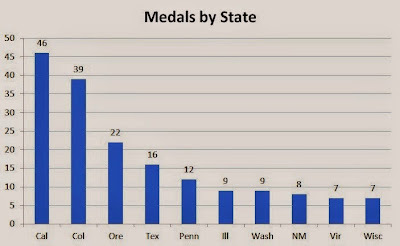 But, in 2014, Virginia won only seven medals, slipping to 9th/10th (as shown in the graph above). That's still a respectable showing, and includes two gold medals: one to Devils Backbone, for its Schwarzbier, and one to Hardywood Park Craft Brewery, for its Raspberry Stout," the first medal of any sort that a Richmond brewery has brought home from the GABF" (according to Richmond beer columnist Lee Graves). In terms of degree-of-difficulty, brewer Kristi Mathews Griner of Capitol City Brewing Company, in Arlington, Virginia, should get a special commendation. Her Amber Waves took a silver in the American-Style Amber/Red Ale division, competing against one-hundred-thirty-nine other beers, the most of any category won in the DMV, and the fourth toughest competition, nationally. But top honors must go to Devils Backbone, in Virginia, which not only won four medals —the only local multiple-winner— but repeated as a national champion for the third time in as many years. At the 2012 GABF, the Devils Backbone 'Basecamp,' in Roseland, won Small Brewpub of the Year; in 2013, again, but as Small Brewery of the Year. This year, the brewery's production-only facility —which the company calls the 'Outpost'— won Mid-Size Brewery of the Year. In addition, in 2010, Devils Backbone won, globally, as the World Beer Cup Champion Small Brewpub. In a few short years, Devils Backbone has become the elite brewery of the area, and in the top tier, nationwide. So, here they are: thirteen awards altogether in the DMV, for ten different breweries, including three gold medals. Congratulations to all! DC Brau Brewing Co.: Washington, D.C.
Gordon Biersch Brewery Restaurant: Annapolis, Maryland. Gordon Biersch Brewery Restaurant: Rockville, Maryland. Union Craft Brewing: Baltimore, Maryland. DuClaw Brewing Co.: Hanover, Maryland. Heavy Seas Beer: Baltimore, Maryland. Devils Backbone Brewing Co. -Outpost: Lexington, Virginia. Hardywood Park Craft Brewery: Richmond, Virginia. Capitol City Brewing Co.: Arlington, Virginia. Devils Backbone Brewing Co. -Basecamp: Roseland, Virginia. Three Notch'd Brewing Co.: Charlottesville, Virginia. See the style categories for the 2014 GABF: here. Read the full guidelines that the judges used to award the medals (as a download): here. See all the results on the GABF website, including results from every GABF beginning in 1983: here. Download the list of this year's winners: here. 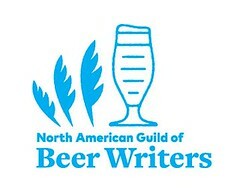 Wonder what the 49,000 attendees did while at the GABF? Well, yes, they drank beer, but which ones, and what else? The Men's Journal has its list of "19 Worthy, Weird, and Wild Moments from the Great American Beer Festival." Thanks for the kind shout out!! But credit must go where credit is due. The Silver in the Amber category was a team effort. That batch of beer was a double brew, half done by me and half by Ferdinand McAdoo, our assistant brewer. Also, the most perfectly brewed beer will not judge well if it is not bottled well; our Lead Brewer Matt Ryan bottled that beer and got it to the judges in fine condition. It is worth noting that this is the second medal winning beer that Matt has bottled, as he also bottled Dave Warwick's medal winning gluten free beer back at Rock Bottom- Arlington. So accolades go to the Cap City Team as a whole! We've got a fine bunch of guys working here.